After introducing the league system, DDTank have been welcomed by more players. Selling special items in the league shop, increasing the success rate of fortifications in the league armory, and a convenient storage place the league backpack have bought advantages to all players in the game. This time, DDTank developer has made another change to the league, allowing your boatyard to be done faster! Then, what is the new facility？Take a look at the picture below. Beside league backpack, a new button has been added——“League Skill”! Click this button, you can open the skill page. However, the league skill can only be activated by the league chairman, and this requires league wealth. That’s ok! players that are not league chairmen, also have skills to activate——Individual Skill! of course, this will also require wealth, but it will be deducted from your own wealth, the one you have contributed to the league. 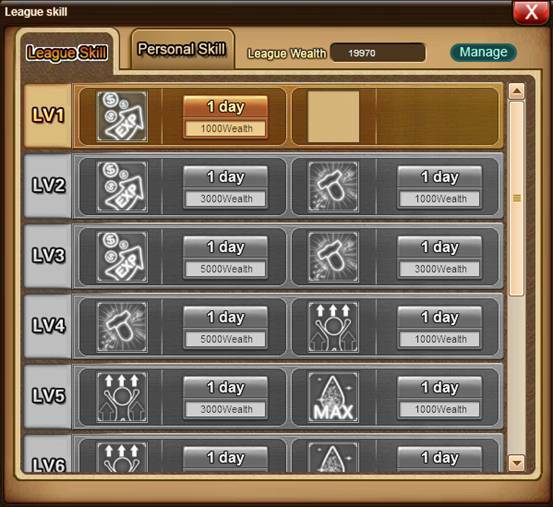 Having said that, everyone might be worried, what if I have low wealth, only just enough for the league shop and armory, once I use the skills, does it mean I can’t use the other 2 facilities？don’t worry, when you gain enough wealth for the facilities, the system records it down, using the individual skill will not make you lose access to the other 2 facilities! what are you waiting for？use it boldly! After League Skill and Individual skill have been activated, when players are in fights or boatyards, you can see the skills you have, moving the mouse over those skills will allow you to read their effects! Skills can be stacked, and they are guaranteed to give you power, and make your boatyard easier, sports fight happier!